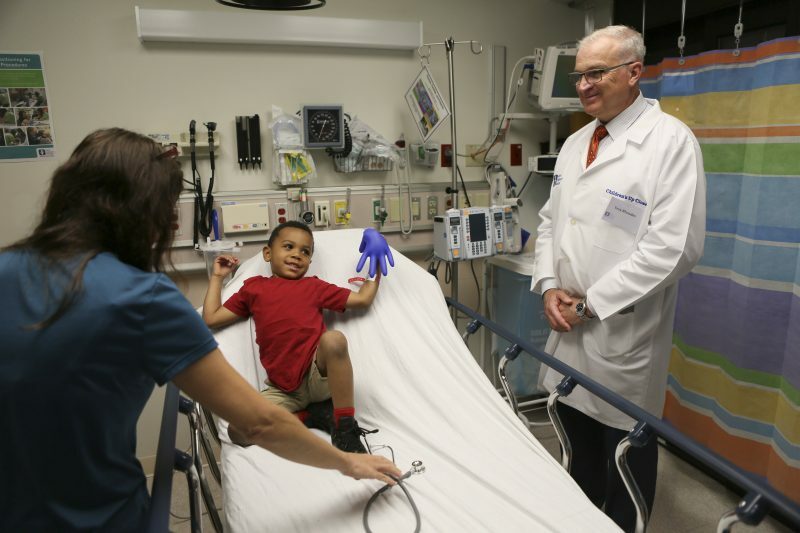 A record 25 local business and community leaders shadowed Akron Children’s Hospital Mahoning Valley clinicians during the 8th annual Up Close day. The program is aimed at increasing awareness of the hospital’s programs and services, and opening lines of communication between the medical staff and community representatives. “Akron Children’s Hospital is truly a community asset, and we started this program to give community representatives a first-hand view of what our doctors and nurses do on a daily basis, both to enlighten them and to solicit feedback on how we can better serve the region,” said JoAnn Stock, senior director of development, Akron Children’s Hospital. Alexa Sweeney Blackann, vice president at Sweeney Chevrolet Buick GMC in Boardman, was among the community participants. She followed Dr. Jackie Lickliter, a pediatrician at the hospital’s Boardman pediatrics office. Troy Rhodes joins Dr. Mary Costello as she looks in on Odell Oakley at Akron Children’s Hospital Mahoning Valley. Business Journal Vice President of Operations Mike Moliterno was another participant. He followed Dr. Larry Shaffer, who was doing rounds on the hospital’s pediatric floor. Many of the patients, Moliterno said, had respiratory infections, very common this time of year. He said the routine was that Dr. Shaffer would consult with the attending nurse outside the patient’s room. They would go over patient history, the latest tests results, what the child said, what the mother said, what they were seeing with their own eyes, and then they would go in and check on the patient. “It was actually amazing when I thought about it,” Moliterno said. “Years ago most of these patients would have had much different outcomes. But here they were, eating pancakes, watching cartoons, in a beautiful hospital, being attended to by people with all the knowledge and tools needed to help them.